Today I used Painter to create this digital woodcut, starting with a photograph that I took about ten days ago when I was at The Food Project, on the last pick-up day. I saw a big bin full of little pumpkins, so I took a couple of pictures, intending to save them for the fall holidays. Today I went back to the pumpkin photos and cropped this image from one of them. 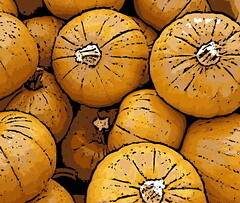 Then I had to clean up the pumpkins with digital pastel. I worked with the woodcut tool, using trial and error until I had the amount of black outline that I wanted. I thought the woodcut effect would be a good choice for October 31. 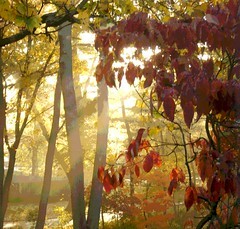 This is a posterized version of the image I published here yesterday: a photo that I took recently of the golden morning light through the trees. I used Painter to do the posterizing, and well as some clean-up with digital pastel. Yesterday, a little after 8 AM, I looked out the window and saw the most beautiful golden light, so I grabbed my camera and took some photos. Tonight I cropped this image out of one of the photos. Then I opened it in Painter and used some digital pastel to clean up some distractions (torn leaves, for example), and while I was at it, softened and obscured the house in the background. Despite the slightly quirky composition, I am happy with this image. But I thought it would look even better posterized, so I tried it and it does. I plan to post the posterized version tomorrow. 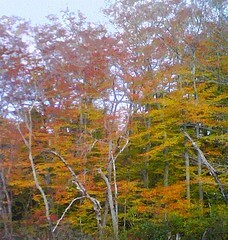 Yesterday as I was leaving the local Y, I saw some beautiful autumn leaves. I liked the combination of oak and maple, so I took a couple of pictures. Tonight I cropped this image out of one of the photos, and I did a little light editing in iPhoto (adjusted the lighting and used the retouch tool in a couple of places). Yesterday I took a walk at Bradley Palmer State Park in Topsfield, Massachusetts. 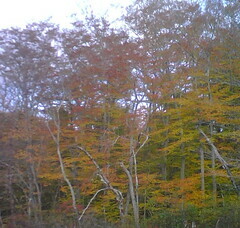 The foliage was wonderful, but I had forgotten to bring my digital camera. So I took a picture with my cell phone (posted here yesterday). I was glad to have the image because it had potential, but it needed a little help. So tonight I opened the image in Painter, adjusted the exposure, and then posterized it. The blue sky had been washed out by the camera, so I corrected that with some color overlay; while I was at it, I used a little color overlay on some of the foliage that had been washed out by the exposure. Then I cropped the image again, and here it is. Although this a digitally manipulated image, it is actually closer to what I saw than the photo that I took with my cell phone! It was very warm today, and on the way home from the vet this afternoon, there was time for a late afternoon walk, and Bradley Palmer State Park, in Topsfield MA, was on the way. The trees were gorgeous, but I realized that I had left my camera at home (something that I rarely do). But I still had my cell phone, a Blackberry Pearl that has a pretty good camera, so I took this photograph. Tonight I used iPhone to crop the original photo and get this composition. It's not a great image, but I am glad to have it, because it has potential. To be continued. . . .
Today I took some photographs during an afternoon walk at Dane Street Beach, here in Beverly, MA. I liked the soft look of the shore line in the distance. Tonight I used iPhoto to crop this image out of one of my photos, and then cleaned it up a little bit with the retouch tool. 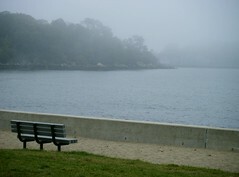 Once I had cropped the image, I could see that in spite of the fog, some of the private homes on the opposite shore were still visible. 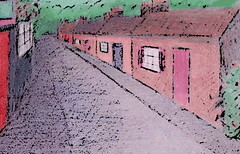 I didn't want to include the houses in this photo, so I opened the image in Painter and used some cut and paste as well as digital pastel to obscure them. This is a stroke-by-stroke video of the digital sketch I posted yesterday. 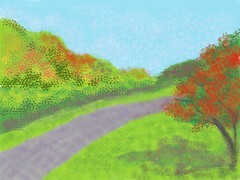 I used the Brushes app in my iPad to draw an October landscape. Brushes also captures each stroke while you draw and you can export these "actions" as a video. But I had some problems with the process in this case. For some reason, the little video stopped short, before the drawing was completed, and at a pretty awkward point. I had decided not to post it, but decided to try something I learned recently at my one-on-one lessons at the Apple Store. I had already made the file into a Quick-Time movie, so I dragged it into iMovie. Then I added the image of the finished drawing to the end of the movie, and it worked, so here it is. This is a digital sketch that I drew tonight on my iPad, using the Brushes app. I worked from my imagination, as well as from recent memory. As I drive around doing errands, I often see fall foliage and little scenes like this on country roads here on Boston's North Shore. I have been planning to learn more about using the tools in Brushes to create texture, so I decided to draw an autumn scene. I think it was a good choice. I had fun, and learned quite a bit. Yesterday we made our last trip to The Food Project for the year. 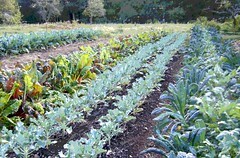 (This is a CSA--Community Supported Agriculture--and it grows organic vegetables on some big fields over at Long Hill Gardens here in Beverly, MA.) We hoped to beat the weather, but as we set out, the sky got dark, it started to rain, and we even saw some light hail. 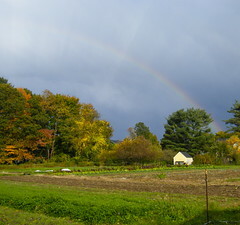 But soon after we got to the fields at Long Hill, the sun came out, and a rainbow appeared. I grabbed my camera and took some pictures. We were glad the rain stopped so we could enjoy the last day. I certainly got more than I bargained for when we joined the CSA. (And I don't mean all that summer squash and all those turnips.) I didn't know how much I was going to enjoy the weekly "field trips" and the ensuing adventures in the kitchen. So this rainbow seemed like one more surprise, another bonus at The Food Project on the last day of the season. 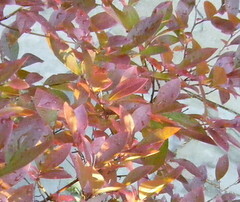 Here's one more look at those blueberry leaves in the sunlight. I used my photo (posted two days ago) to create this digital woodcut with my Painter program. In a digital woodcut, you get less emphasis on color, and more emphasis on line. I did a final crop of this tonight in iPhoto to focus attention on the lines of the branches. I am happy with this image, but my favorite of this little set is the posterized version that I posted here yesterday. Yesterday I posted my photograph of blueberry leaves in late afternoon light. Tonight I am publishing this posterized version of the image, created with my Painter software. Earlier this week, I was in the kitchen around 5 PM, starting to organize dinner. It had been raining, but the sun was out. I looked out the back window and saw the late afternoon light on the blueberry bushes, so I went outside with my camera. I took some pictures from the back deck, looking down on the bushes, with the flagstone on the patio as background. Tonight I cropped this image out of the best of the photos. Then I opened the image in Painter and used digital pastel to do some digital gardening, getting rid of some grass and weeds in the flagstone. I also eliminated some of the cracks entirely in a few places so that the leaves would show up more clearly. 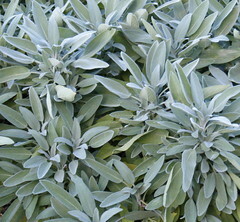 So the gray background has been fiddled with, but I didn't touch the leaves. They are just as they looked as they came straight out of the camera. I have been working with a photograph that I took recently at Long Hill Gardens, oakleaf hydrangea leaves turning from green to purple. Last night I used Painter to create this digital woodcut from the photo. I used the original colors, but I fiddled about with the controls, changing the amount of black and the "heaviness" of the print, until I had what I was after, a "digital print" that emphasized the tracery in the leaves. 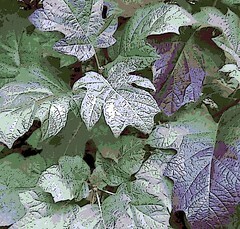 Tonight I used Painter to create a posterized version of the photograph that I published here last night: a picture of oakleaf hydrangea that I took at Long Hill Gardens. I like the way the leaves are turning from green to purple. Posterizing the photo intensifies the colors and simplifies the shapes, but in this case the difference is somewhat subtle unless you look closely. I also used Painter to create a digital woodcut from the photo, and I plan to post it here tomorrow. This is a photograph that I took during a walk at Long Hill Gardens on Thursday afternoon. I saw this shrub while I was walking down a path. The leaves are huge, probably about a foot long from stem to tip. And right now, they are transforming themselves from from green to dark purple. I like the color and the shape of the leaves, which look like oak leaves (hence the name, oakleaf hydrangea). Tonight I used iPhoto to do a little bit of retouching and then cropped it to get this composition. Day before yesterday, I posted a little abstract sketch that I drew on my iPad, using the Brushes app. Brushes captures a stroke-by-stroke video of the drawing being created, and here is the video for "Dance with Me". (I was thinking about dance steps as I drew. Does it show?) In any case, I hope you like it. Just push play. 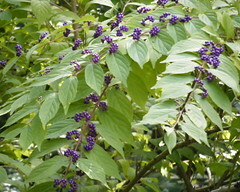 This afternoon during a walk at Long Hill Gardens, I noticed some leaves with bright purple berries. I don't think I have ever seen anything quite like this before, but I searched on "The Google," and found out that it is called "Beauty Berry" or "Issai". Anyway, I liked the shapes of the leaves, the placement of the berries, and most of all, the color. I took this picture, and tonight cropped it to get this composition. Lately, life has been very busy, and I haven't had time to use the Brushes app on my iPad. But tonight I took advantage of a brief break in the action to do what makes me happy. I have dance steps on my mind from the moves in my new Zumba class today, so I thought I would use that as my inspiration. (Dancing also makes me happy!) I was going for a light-hearted mood in this little sketch, so I used bright colors and chose some of the options in Brushes that let you draw in stripes and polka dots. I called this version a "final cut" because I cropped the image after I transferred it into iPhoto. (The format is predetermined in Brushes.) So here's a little happy dance, posted on the day the miners in Chile were rescued. This is a photograph that I took today during a morning run to BJs, one more errand in a day that was already jam-packed with things that I Had To Do. But it was time: needed to get paper towels, shredded cheese, batteries, eggs. Boring, but necessary. 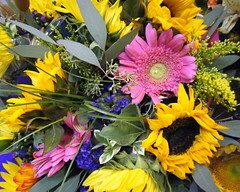 Coming around the corner of the very last aisle, on the way to find the dental floss, I passed the little flower display and saw some fall bouquets with sunflowers. I loved the shapes and colors, so I stopped to take a couple of quick photos, and tonight I cropped this image out of one of them. 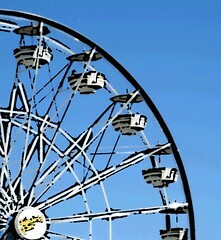 Here is one more version of the ferris wheel scene. 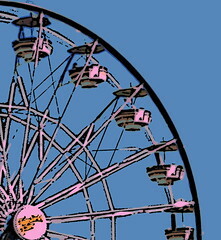 This is a digital woodcut created with Painter from a photo I took during a recent visit to the Topsfield Fair. To make this image, I used the image I posted here yesterday, a digital woodcut made with a color set, but added a color overlay. Although I took the original photograph in the afternoon, this image reminds me of how the rides looks as it gets dark and the lights come on. I said before, I can get a lot of mileage out of a short visit to the fair. I made it to the Topsfield Fair this afternoon and spent an hour or two walking around, sampling the food, looking at exhibits, and just enjoying the experience. Going to the Topsfield Fair reminds me of going to the Colorado State Fair as a kid, which is probably why I enjoy going. We walked around the midway and looked at the rides, and I took a few pictures. 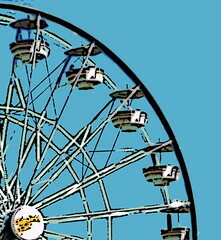 I like the geometry of the ferris wheel, so tonight I cropped this image out of one of my photos and used Painter to turn it into a digital woodcut. Like yesterday's post, this image began with a photograph that I took during a weekly trip to The Food Project at Beverly, MA. (This project is Community Supported Agriculture or CSA, and on Thursdays we go to pick up our vegetables.) Yesterday we went out to the field to pick our own kale and Swiss chard. I loved the colors and patterns, so I took a photograph of the field. Tonight I opened the original photo in Painter and used some digital pastel to obscure a big hose, and to clean up a few leaves. 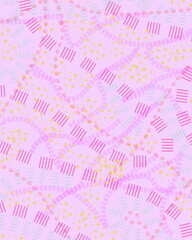 Then I posterized the image, and cropped it to emphasize the converging lines. I called it "Fields of Greens" because I like the pun, lots of greens in this picture, for cooking and for painting. This is a pair of earrings that I made several years ago. 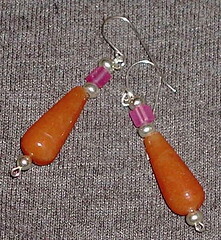 The findings are sterling silver, and the beads are aventurine, pink jade, and sterling silver. Last spring, I sent them to a friend in Brazil as a gift. Tonight I came across a photo of them, and wondered why I had never posted it here. My guess is that I wasn't happy with the photograph. But tonight I used iPhoto to adjust the exposure and crop the image, and now I like it well enough to post. Yesterday I tried some "post-production techniques" on a little sketch that I drew several years ago (posted here on June 20, 2005). The drawing was houses that I saw during a visit to Northern Ireland: all alike, all brick, with chimneys lined up in a row. I used Painter to create a posterized version of the sketch, posted last night. I also used Painter to create a digital woodcut of the same image, and here it is. Every time I open the photo browser in my computer, one of the first images that comes up is a sketch that I called "Chimneys in Northern Ireland". And every time I see it, I wonder what it would look like posterized, or as a woodcut. Tonight I decided to find out. 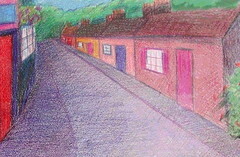 I drew the sketch back in 2005 when I was visiting Belfast. I used pastel sticks and worked from memory to draw the houses I had been seeing during the trip, especially those in Belfast as well as Bangor, NI. The original version of the sketch is posted here (June 20, 2005). Tonight I used Painter to posterize the original image, and then cropped it a bit, and the result is what you see here. I also used Painter to create a digital woodcut from the same image, and I plan to post that here tomorrow. This image began during a walk by the Bass River here in Beverly, MA, right behind Starbucks, where lots of wild flowers grow. By August, the Queen Anne's lace was quite tall. 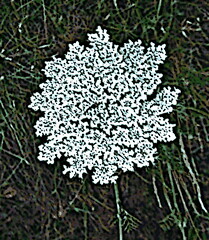 I have always liked the texture of this flower. Tonight I cropped the original photo and used Painter to make it into a digital woodcut. 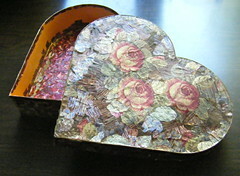 Today I finally had a chance to get back to this project, a heart-shaped box that I am covering with decoupage and collage designs created from printed metallic ribbons. Today I worked on the inside wall of the box, which I am covering with a ribbon printed in a paisley design in pink and blue. I have been working on establishing the top and bottom edges of the area. The bottom edge is predominately light pink, so it will contrast in value with the adjacent red interior. For the top edge, I am using pieces that have some blue, because I am trying to create a pale blue border. This image began with a photograph that I took on Thursday afternoon. I was at the Food Project (at Long Hill Gardens in Beverly, MA) for the weekly pick-up of produce. On my way over to the field to pick cherry tomatoes, I saw some lettuce growing. 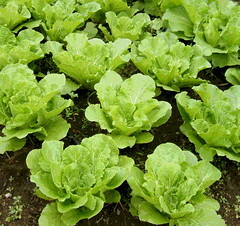 I liked the shapes, colors, and most of all the pattern of the rows of lettuce, so I took a picture. 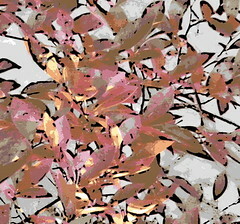 Tonight I used Painter's digital pastel to clean up the leaves. I also used digital pastel, along with some cut-and-paste to simplify the background and do a little digital weeding. Then I posterized the image and cropped it to get this composition.